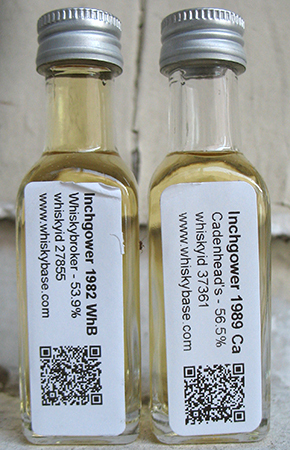 Here is another 24, yo from 1990 from another relatively obscure Speyside distillery in Diageo’s portfolio: Inchgower. Inchgower produces mostly for blends—as with other Diageo workhorses, a Flora & Fauna bottling may be the only regular official release (I’m not counting the special Rare Malts and Manager’s Choice/Dram releases). Johannes of Malt Madness says of Inchgower that “the malt whisky is of excellent quality – at least the stuff they used to distill around 1980”. I am hopeful that someday soon I’ll get to experience some of this. I’ve not had very many, all have been pretty old and none have excited me (see here for quick notes on the two I’ve reviewed for the blog). “Quick Hits” will cover tasting notes of whiskies I have small’ish samples of that are not sufficient for me to draw detailed notes from. They should be taken with a larger pinch of salt than my other notes are. They do not include ratings. First up, two Inchgowers from the 1980s. I know very little about Inchgower and indeed these are the first whiskies I’ve had from this distillery. I gather the profile is generally sherried; these however are both from bourbon hogsheads. Will they make me want to try more?